TEQUILA.net – Frederick Wildman and Sons, Ltd., is pleased to announce that it has officially—and legally—become the national importer of Ilegal Mezcal (pronounced eeh-lay-gal), a traditional Mexican liquor made from the agave plant by mezcaleros in Tlacolula, Oaxaca (Mexico). 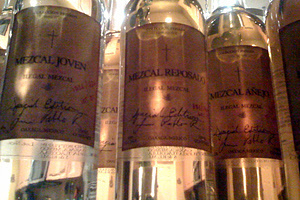 The somewhat sinister, yet unique name, arose form John Rexer's numerous expeditions south across the border, "creatively" bringing his favorite mezcals to patrons of his bohemian tequila/mezcal bar, Café No Se, in Antigua, Guatemala. "I fell in love with Mezcal in Oaxaca, the heart and home of Mezcal culture," commented John Rexer, owner of Ilegal Mezcal brand, "and I wanted to cultivate this cultural love affair that began for me three decades ago, and share it with the rest of the world." Unlike most Tequilas which are, today for the most part, distilled industrially, Ilegal Mezcal is a 'small village' effort—a product entirely handcrafted from the heart of the Espadin agave plant found in various towns across Mexico. The age-old process begins by baking the agave in an earthen pit which is stone ground to a pulp; leaving it to naturally ferment, and then, distilling twice in small batches. "We work with small artisanal palenques because we love the mezcal they produce and the Oaxacan culture from which it comes," says John. "Traditional, artisanal mezcal – vintage, small batch and handmade – is a part of Oaxaca that links the individual and the community to the land and sun and time. By working with these small producers throughout Oaxaca we hope to help preserve both the tradition and the spirit." Rexer believes, "Mezcal is not a product, it is a culture. It is as nuanced as the lines in the hands that make it. It is the opposite of industrial. It is familial, communal and ceremonial. It is new each year and the same as it was 500 years ago." "Mezcal is something from the earth, all natural," says Rexer, "the only ingredients that are permitted in the making of this product are: agave, water, sun, location and time. Mezcal is actually not a product", he continued, "it is a culture, and to drink mezcal is to enter the ritual of Oaxaca." Ilegal Mezcal produces three different styles: Joven, a lighter-styled mezcal with notes of anise, white and red pepper, light fruit with a smooth, lingering and heated finish. The Reposado has more of a caramelized tone, with notes of chocolate, butterscotch, medium smoke and some heat with a longer finish. Lastly, the Anejo offers bitter orange notes with hints of maple and cloves ending with an oaky finish. The Ilegal Mezcal line will be available immediately through Wildman's network of distributors in selected markets: New York, California, New Mexico, Arizona, Texas, Illinois, Washington, Oregon, Colorado, Florida and Massachusetts. The suggested retail prices are: $55 for the Joven, $70 for the Reposado and $110 for the Añejo. Importers of fine wines and spirits since 1934, Frederick Wildman and Sons, Ltd., is committed to excellence, and is a major force in the world of wine in the United States. The familiar Wildman oval found on every bottle sold is recognized around the world as a symbol of quality assurance. The company has become what Frederick Wildman's president and CEO Richard Cacciato calls "the biggest little wine company in America." For more information on news about Frederick Wildman and Sons and Wildman wines, please contact Odila Galer-Noel at 1-800-RED WINE X 911 or visit www.frederickwildman.com.